This past Friday I headed to my amazing stylist Kim Allison @ the Apricot Lounge Salon to get my hair layered. I liked my weave before but after she worked her magic I fell in love with it! I have a full face and needed some soft layers to remove a bit of the bulk from the weave (though I only used about 4 ounces of hair) and frame my face. Might I also add that I'm in love with my closure!!! I didn't understand how important the closure was for a full weave. 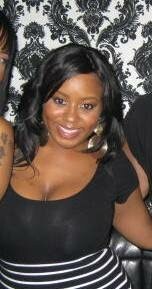 For anyone that's curious, I have the Extensions-Plus Zig Zag Natural Body closure in style 1, size small. I was cool before the cut but now I'm absolutely smitten! For all of my fellow summer weave wearers I'm glad to have joined the club!